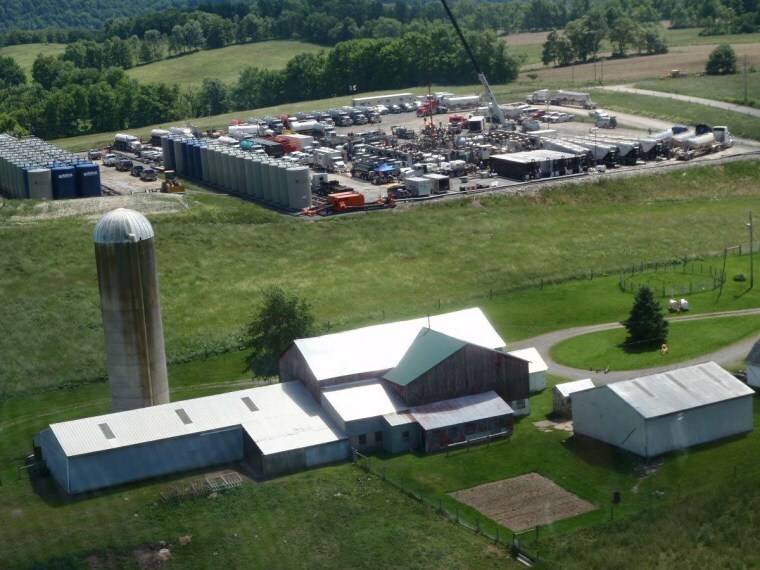 Elevated levels of methane and other stray gases have been found in drinking water near natural gas wells in Pennsylvania's gas-rich Marcellus shale region, according to new research. In the case of methane, concentrations were six times higher in some drinking water found within one kilometer of drilling operations. "The bottom line is strong evidence for gas leaking into drinking water in some cases," Robert Jackson, an environmental scientist at Duke University in Durham, N.C., told NBC News. "We think the likeliest explanation is leaky wells," he added. Producing natural gas from shale rock formations involves a technique called hydraulic fracturing, or fracking, that shoots several million gallons of water laced with chemicals and sand deep underground to break apart chunks of shale, freeing trapped gas to escape through cracks and fissures into wells. The technique has unlocked the potential to usher in a new era of energy independence and may serve as a bridge to a clean energy future. But the fast-developing industry has raised a host of environmental concerns, including the potential for drinking water near natural gas wells to become contaminated. The new research builds on earlier work from Jackson and his colleagues that also found high concentrations of methane near natural gas wells. In this new study, Jackson's team analyzed 141 drinking water samples from private wells across northeastern Pennsylvania. In addition to the higher methane concentrations, the new study documented higher ethane and propane concentrations. Ethane concentrations were 23 times higher at homes within a kilometer of a shale gas well. Propane was detected in 10 samples, all from wells within one kilometer of drilling. All the gases appear to be fossil in origin. "That is the point of the ethane and propane analyses in the paper," Jackson said. "Those are gases that are not generated by microbes" that can live in the ground and affect well water. The researchers also conducted chemical analyses of hydrocarbon and helium that suggest the gas found in some instances comes not just from the ground, but from leaky steel pipes used in the extraction system, Jackson added. "If you have a casing leak (in the tubing), you might expect to see other things through time," he noted, "not just the gases, but whatever is coming up out of the well." The methane contamination may be a result of cracks in the cement that surrounds the outside of the steel tubing and serves as a barrier between the rock that is drilled through and the well. An improper cement job, Jackson explained, could permit gas from a pocket at mid-depth to move into the space outside the well, and move up to the drinking water. "In that case, you would never expect to see Marcellus gas or, more importantly, fracking chemicals and metals and salts" in the drinking water, he said. The biggest known risk of high methane concentrations in drinking water is an explosion or fire due to the buildup of the gas in a confined space such as a basement or a shed, Jackson noted. "The flip side of that is the Environmental Protection Agency doesn't regulate methane in drinking water, so we really don't know much about the health risks." Naturally occurring methane is "ubiquitous" in water wells throughout the study region, Steve Everley, with the natural gas industry group Energy-in-Depth, writes in a blog post that characterizes the new study as full of flaws. Chief among them, Everley argues that methane is ubiquitous in the region, and that the Duke University research team found methane in water wells "nowhere near natural gas wells." The group also notes that the new research does not find evidence of fluids used during fracking in the groundwater. "On that point, at least, we're happy to agree with them," Everley writes. Radisav Vidic is a civil and environmental engineer at the University of Pittsburgh who recently conducted a review study of the scientific literature about environmental issues related to hydraulic fracturing. The new research, he told NBC News, will "help us to better understand the whole picture of potential risks," related to the fast-evolving industry. But, he added, there is a lack of background data on these drinking water wells from before the onset of drilling for comparison. So, the findings of higher methane contamination near natural gas drilling is "not a direct proof" of a link, he said. "We don't have the data from before the industry came to town." Jackson and his team are trying to build this baseline data, which requires greater disclosure from the natural gas industry through the release of well records, for example, so researchers can compare the chemical signature of the methane, ethane and propane they find in drinking water with the natural gas wells. "The long term goal is to understand why problems occur and keep them from happening somewhere else," he said. "We want to work productively to make things better." The new research appears in a paper published online today by the Proceedings of the National Academy of Sciences.